Rule for Social Media: it is better to be really good on one site than bad on many. Everybody is on social media now. OK, that is a slight exaggeration. Only 2 billion of the planet’s 7.2 billion people have active social media accounts. 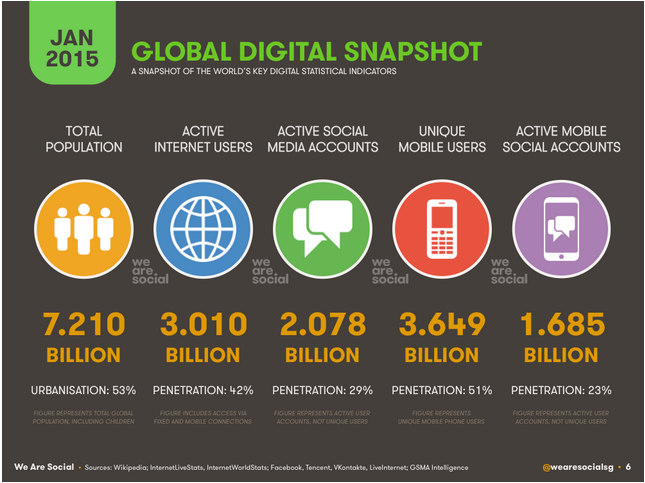 What is even more incredible is that there are almost 1.7 billion active mobile social users now. Strictly from a business opportunity standpoint, I would like to say, “wow!” How and where else can you reach almost a third of the earth’s population so easily, so cheaply and so personally? It is a marketer’s dream and, if you are doing it right, you should be using social media marketing to dominate your market. So, why isn’t social media working for you? The following are five common reasons why I see most people, companies and brands fail at using social media to grow their businesses. 1. You have to “pay to play” on Facebook. Facebook is still, by far, the largest social media site with 890 million active daily users and 1.35 billion users overall. In 2014, the network earned almost $12.5 billion in revenue almost exclusively from advertising on the site. Coinciding with this massive jump in revenue is the dramatic decrease in the percentage of traffic that reaches fans and followers organically (meaning free). Related: What Matters More, the Quality or Size of Your Social Media Audience? Facebook has publically admitted that it is systematically decreasing that “free traffic” percentage over time to 1 to 2 percent of all traffic. For you, the business owner, that means if you plan on using Facebook to sell your products and services to your fans, you will need an advertising budget. Even a small budget can create huge return on Facebook. This tip goes hand in hand with the point above. One of the best ways to “pull” market on social media is to be useful to your community on a consistent basis without the expectation of selling them something immediately. I know that seems a little counter-intuitive, but let me explain how that works. Guess what? Some of those people will get your ebook and want you to do the exact same things you told them to do in your ebook but pay you to do it. That is being useful, and that is pull marketing.